On Saturday, February 25, Navajo Community Planners, Inc. (NCPI) conducted a community cleanup in Grantville. NCPI members were joined by members of other community organizations. 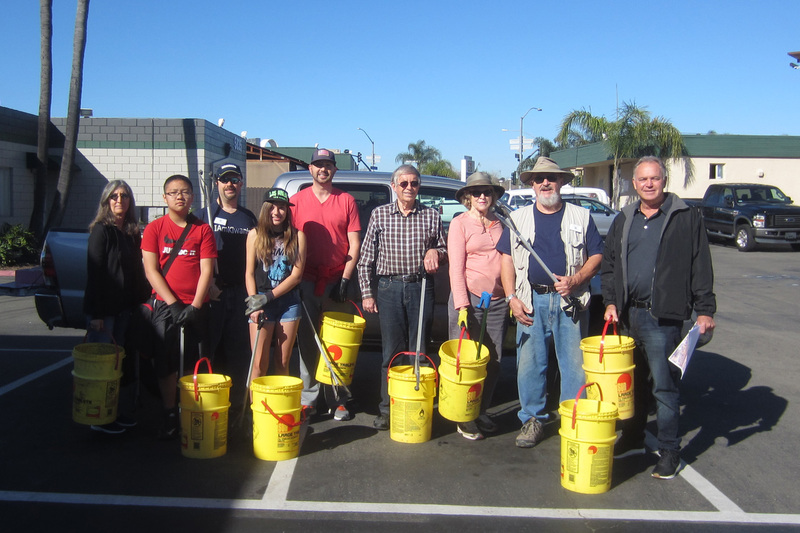 The group worked for 2 1/2 hours picking up trash along Camino Del Rio North between Mission Gorge Road and Ward Road, Alvarado Canyon Road between Mission Gorge Road and the Waring Road Flyover Bridge, and the area under and adjacent to the Fairmount/Mission Gorge Road I-8 Interchange. And all the trash was collected next to sidewalks. No excursions were made into the Alvarado Creek Storm Drain. Thank you to NCPI Board Member Dan Smith for allowing us to use his property as a staging area and accommodating the 3 cubic yard dumpster donated by Republic Services, Inc.
Over 2 cubic yards compacted trash was collected; most of small pieces of paper and cigarette butts. Members of several community groups that participated in this event represented Board Members of Navajo Community Planners, Inc. (NCPI), members of the Grantville-Allied Gardens Kiwanis Club (GAG Kiwanis), members of the Allied Gardens Community Council (AGCC) and members of the Lewis Middle School Builders Club sponsored by the GAG Kiwanis. A big community thank you to everyone who participated and a thank you also to I Love A Clean San Diego for providing all the trash and recycle bags. There are a number of areas within the Navajo Community that can use some attention. Don’t hesitate to get involved in your community. This entry was posted in Grantville by NCPI. Bookmark the permalink.